Doc Mock’s Movie Mausoleum » Blog Archive » Episode 10 Now Online! Ever wonder what it would be like to use your gymnastic skills and a nerdy friend’s technology to battle an army of psychos who blindly follow an evil transvestite? Sure you have! And that’s why you need to watch our latest episode from last week! 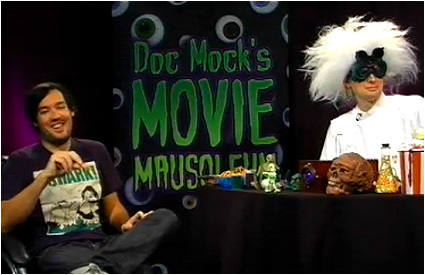 Yes indeedy, Episode 10 of Doc Mock’s Movie Mausoleum is now permanently archived online for your viewing pleasure! Big thanks again to our special guest Eric Appel for joining in all of the merciless mayhem of episode ten and sticking around in the chat room with us for some dancing and other antics afterwards! As always, you can view any other archived episodes in Doc Mock’s channel on theStream. We’re now on a break until mid-September while theStream does some major upgrades to the studio. The show should look even better when it’s all said ‘n done, plus we’ll be available on iTunes!